The Falcons traded star OT George Kunz to the Colts to obtain the first overall pick in the 1975 NFL draft in order to select Bartkowski, who passed for 2580 yards as a senior and was already acclaimed for having a strong throwing arm, although he was also immobile and strictly a pocket passer. He was immediately inserted into the starting lineup and received NFC Rookie of the Year honors after passing for 1662 yards and 13 touchdowns. Bartkowski followed up his promising rookie year with two poor seasons in 1976 and ’77, missing much time to injury and playing badly when healthy, and seemed on his way to becoming a major first-round bust. However, he regained his starting job four weeks into the 1978 season and led the Falcons to the first postseason appearance in franchise history. He also played well in the Wild Card playoff win over the Eagles and a near-upset of the Cowboys in the Divisional round. While the team dipped in ’79, Bartkowski continued to improve, throwing for 2505 yards and 17 TDs, although giving up 20 interceptions. Falcons went 12-4 to finish first in the NFC West. Lost NFC Divisional playoff to Dallas Cowboys (30-27). 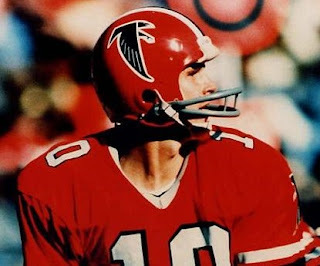 Bartkowski had another Pro Bowl year in 1981, throwing for a career-high 3829 yards and tossing another 30 touchdowns, although the Falcons dropped back to 7-9. He led the NFL in passing in 1983 (97.6 rating) as he threw for 3167 yards with 22 TDs and just 5 interceptions and led the league in completion percentage (67.3) in ’84. However, the team’s performance was dropping off and the effect of taking many sacks (356 in all) was causing shoulder and knee injuries. After appearing in just five games in 1985, Bartkowski was dealt to the Rams where he was 4-2 as a starter in ’86 before knee problems finally finished his career. Overall, he played 11 years for the Falcons, as well as the one abbreviated season in LA, and completed 55.9 % of his passes for 24,124 yards with 156 TDs and 144 interceptions. His 23,470 yards and 154 TDs with Atlanta were franchise career records that were eventually exceeded by Matt Ryan.